So this is the last test and here is thing about the problem…. In the post the problem occured first, I edited and saved many times before I published it. Just after I published the post, the code showed up. I edited again to remove it, but it shows up again after saved. This happens and happens again. 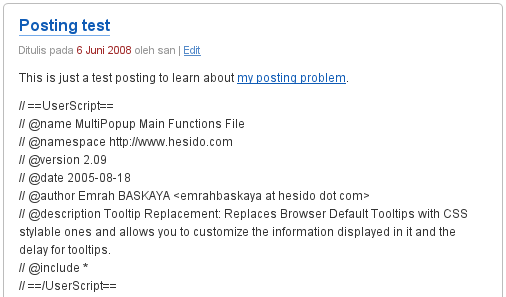 I then asked to the forum about the problem, and some suggested to contact support, so I did. The answer from the support team came very fast, stating that the code was removed. I went to the public view of the post and see that the code wasn’t there. So I went back to the editor, added insignificant change and save, and voila, the code was there again. (I save the draft of this last testing post, and nothing happens). 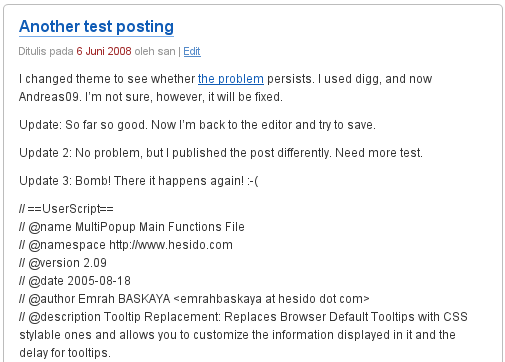 I wrote a testing post [img/png 22KB], oneline post and saved it and published it right away. The code didn’t show up. But it did after I edited and saved it again. I changed the theme (thinking if it’s related) and posted another test [img/png 28KB], the code didn’t show up. I edited this post three times, and the code showed up after the third edit. (I just saved this last testing post for the second time, not published yet, and the code has shown up) *sighs*. So I haven’t concluded anything, still clueless on why this is happening, how to fix it. BTW, I’m using Firefox 3.0b5 on Linux, Ubuntu Ultimate Edition. Update (20080607 09:13 WIT): The problem has gone, the following is just the code snippet to show what previously was the problem. The links to testing posts above have been replaced by links to their respecitve screenshoots. // @description Tooltip Replacement: Replaces Browser Default Tooltips with CSS stylable ones and allows you to customize the information displayed in it and the delay for tooltips. I changed theme to see whether the problem persists. I used digg, and now Andreas09. I’m not sure, however, it will be fixed. Update: So far so good. Now I’m back to the editor and try to save. Update 2: No problem, but I published the post differently. Need more test. This is just a test posting to learn about my posting problem.